Versatile, Live, Acoustic Drum Loops for Rock, Alt Rock and Indie Rock Styles! Another jam-packed installment in the Drum Werks Series and same session follow-up to Drum Werks VII. Guaranteed to inspire anyone who needs a raw rock collection of grooves. Drum Werks VIII is a versatile groove package, featuring over 650 acoustic drum loops and a complete matching multi-velocity sample set. This versatile collection of grooves will satisfy any guitarist, bassist, keyboardist with its versatile and infectious collection of grooves and feels. Live from the studio with a diverse range of rock and alt rock grooves, ready for your next songwriting project. 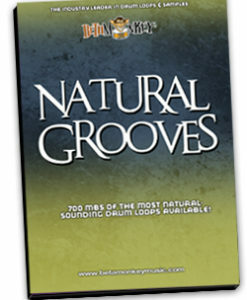 This exciting collection of real drum loops includes 8 different tempo sets with plenty of rhythmic variation for each. With main beats and multiple groove variations, you can quickly lay out a drum track with a great rock feel; live, rock solid, and energetic. 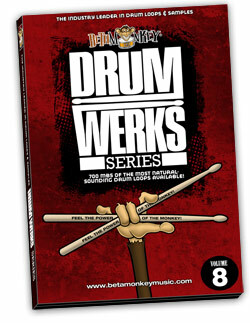 A must-have for anyone who needs drum loops with raw rock energy. As well as being for Alt and Indie Rock tracks, this collection of beats and fills will also find a home in other genres such as pop, experimental, and electronic music. If your music needs live studio drums, Drum Werks VIII will be a solid choice. Full Range of Rock, Alt Rock, and Indie Rock Styles: Get a healthy mix of straight-ahead grooves and more heavily syncopated rock patterns, Drum Werks VIII covers a lot of ground. Straight 8th feels as well as slightly shuffled swingy, triplet-based patterns. In other words, a healthy mix of eclectic grooves. Grooves sets are arranged in Tempo Pairs™ – tempos of direct multiples of one another (i.e., 65 BPM and 130 BPM, 75 BPM and 150 BPM and so on) – this allows even more versatility from the existing grooves and discs. Comprehensive Groove Folders: Grooves sets are arranged in Tempo Pairs™ – tempos of direct multiples of one another (i.e., 65 BPM and 130 BPM , 75 BPM and 150 BPM and so on) – this allows even more versatility from the existing grooves and discs. Cohesive Drum Sounds: A natural, live drum sound, with a good amount of room in the mix. A sharp crack to the snare, punchy kick, and naturally resonant toms – all drum loops and samples were performed on a custom Smith Custom Maple drumkit. The clean, natural, and present mix is consistent throughout Drum Werks VIII (and also on Drum Werks VII), giving users a cohesive sound set with all drum loops are taken from the SAME recording session – perfect for mixing tempos and feels as well as making final mixdowns a breeze. Fully-Sampled Collection of Drum and Cymbal Samples: Multi-velocity samples of all the drums and cymbals recorded are included. Smith Custom Maple drums were used and sampled for these sessions. All cymbals (Zildjian ride, hihats, crashes) are included as well. Compatible with Drum Werks VII: Same session, same versatile drum sound. Drum Recording Session Information: Check out some info from the recording of Drum Werks VIII. 650 (690 MB on the 24-Bit version)) original, license-free drum loops and samples. 16-bit version has same number of loops, but smaller total file size. Available as 16-bit, 24-bit ACIDized WAV, APPLE LOOPS/AIFF, and REX2 loops. Nearly 250 drum loops for rock songwriters, Drum Werks XV covers a wide range of rock drum styles from classic to modern hard rock. 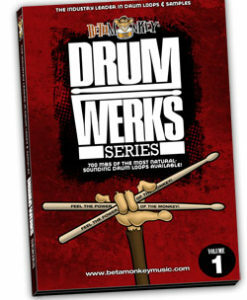 Drum Werks XV is a powerful collection of rock drum loops waiting to lay the foundation for your next rock songwriting project.